According to American Podiatric Medical Association spokesperson Leslie Campbell, many people select footwear that lacks good foot support. As people become more physically active, the likelihood of foot ailments increases, especially for athletes. Sports that emphasize quick side to side movements risk incurring ankle sprains. You will also find activities such as long distance running risk heel spurs and pinched nerves. “We see more young children coming in because they play sports like soccer and wear cleats, which are rigid, don’t absorb shock, cause fatigue and should be worn as little as possible,” Campbell says. Dr. Campbell also advises against wearing cleats off the field and warm up adequately so the joints are supple in the shoe. Proper foot support is important, whether it’s for everyday walking or participating in exercise or sports. A podiatrist like Dr. Neal Mozen of Foot Health Care Associates can make recommendations on how to care and find shoes that fit you, as well as help you with any foot pain you might have experienced from wearing ill fitting footwear. Walking is an everyday function for both men and women. 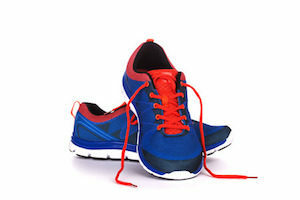 In order to keep your body’s balance in order, you are going to need shoes that provide the proper kinds of support.